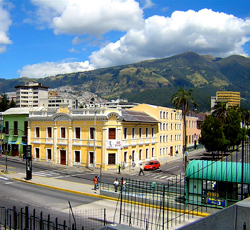 On Saturday, January 11, 2014, nine Cazenovia College students will depart with Shannon Dobrovolny, director of Residence Life, for a weeklong Alternative Breaks project in Quito, Ecuador. The group will spend their time at the Working Boys’ Center addressing educational needs in an effort to reduce poverty. Students will volunteer in the classroom, as well as work on several painting and building projects. For Cazenovia College participants, being completely immersed in diverse environments enables them to experience, discuss, and understand social issues in a more significant way. One of 67 student clubs and organizations currently active on campus this 2013-14 academic year, the Alternative Breaks Program @ Caz (ABC) places teams of students in communities to engage in service and experiential learning during their summer, fall, winter and/or spring breaks. ABC members chosen for international trips have either volunteered for a U.S.-based Alternative Breaks program in the past, or have been selected from a pool of applicants. Ensuring the success of these international programs requires student commitment to planning, which starts a year in advance and includes fundraising. Student-run fundraising campaigns and contributions from the Student Government Association provide the financial support needed to make these trips possible. One of the goals of ABC is to create opportunities for students to gain knowledge, skills and values in settings outside the classroom. Participating in short-term projects for community agencies, such as the Working Boys' Center, provides Cazenovia College participants with the occasion to fulfill this goal. Cheryl Chapman; Alex Hazard; Valarie Mudrie; Jessica Muller; Kathleen Murray; Steven Ochoa; Rachel Palmer; Lara Sibi; Sam Young and advisor Shannon Dobrovolny, director of Residence Life.